The death of H.R.H. the Prince Consort on December 15, 1861, cast a gloom over the yachting season of 1862. Many annual fixtures were either abandoned or shorn of their usual éclat. Though it was understood to be in deference to the Queen’s wishes, it was to the great surprise of the members of the Royal Yacht Squadron and of the Royal Victoria Yacht Club when it was announced, only a day or two before the Squadron week was timed to commence, that no matches would take place. No explanation was offered, and many members of the two clubs had arrived in the Solent in the expectation of racing. The presence of these yachts at Cowes and Ryde accounted for the large number of private matches which stand out as the chief events of the season. As soon as the news became known that the official programme had been abandoned, challenges were at once issued. The two big schooners, Albertine, owned by Lord Londesborough, and Sultana, owned by Colonel Markham, were sailed over the Queen’s course; but in the race an accident occurred to the gear of the Albertine, and one of her crew was knocked overboard, necessitating her heaving-to, and Lord Londesborough gave up the race. The two vessels met, however, a few days later, and Albertine was then declared winner by 5½ minutes, after having to allow Sultana 6 minutes. The Duke of Rutland also raced Resolution against Earl Vane’s Lotus. Both these vessels were topsail schooners, the former of 164 tons and the latter 188 tons. This match was also sailed over the Queen’s course. There was little to choose between these two yachts in the racing, and Lotus was only thirty seconds ahead at the finish after allowing for difference of tonnage. The Duke of Rutland’s vessel would have been winner had she not fouled the Lepe Buoy and given the prize to Lotus. Another private match was that between the two cutters Crusader and Moonbeam, owned respectively by Lieutenant J. Staden and Mr. P. Roberts, and in which the Moonbeam proved an easy winner. The two schooners, Ella, 143 tons (Sir Gilbert East), and Galatea, 143 tons (Mr. T. Broadwood), met, and the former was winner. Galatea was also matched against Mr. G. P. Houghton’s 148-ton schooner Redgauntlet over a course from Ryde round the Warner, Calshot Light, the West Buoy of the Middle Bank and home. Galatea was smartly handled, and succeeded in reaching the finishing line 11 minutes 55 seconds ahead of the Redgauntlet. Julia, 111 tons. In the Match for the Royal Yacht Squadron Cup, August 19, 1853. Built by Ratsey. The Ocean Race from Ryde to Plymouth carried most of the big boats assembled in the Solent westwards. There were seven entries – Galatea, Ella, Marina, Leonora, Gleam, Wanderer, and Julia. The race started on August 14 and finished on the 16th. Marina, a 62-ton cutter, was winner, with Julia, Mr. J. B. Hesketh’s 122-ton cutter, second. Phosphorus, Mr. W. Turner’s 50-ton cutter, was the champion boat of the year. She was designed and built by Hatcher, and made her first appearance in the early part of the season. She won £425 in prizes, carrying off the Cutter’s Cup, value £100, at the Royal Mersey Regatta for yachts of the first and second class of 15 tons and upwards; the Royal Irish trophy, value 60 guineas; the Ocean Race from Kingstown to Cork; the race for a purse of 40 sovereigns offered at the Royal Cork Regatta; the prize of 100 sovereigns offered by the Royal Cork Yacht Club and open to all yachts; and a prize of 30 sovereigns at the Swansea Regatta. In these matches she sailed against such well-known boats as Osprey, Aeolus, Glance, etc. Besides Phosphorus there were five other new vessels built in 1862. 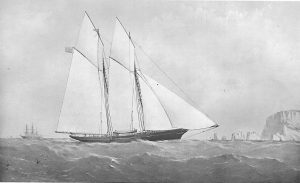 Circe, by Steele and Co., of Glasgow, was a fine schooner of 127 tons. In four matches she won four prizes against Redgauntlet, Diadem, Janie, Irene, Eagle, and Galatea. Redgauntlet, too, was a new boat built by Inman, and showed, on occasion, excellent qualities. Janie was built by Wingate, of Whiteinch, Glasgow, from designs by Mr. T. S. Lane, her owner. These boats were all canvased by Lapthorne. Wren, a 33-ton cutter, and Eagle, a schooner of 236 tons, were built by Mr. T. C. Gibson. The three famous vessels – Enid, Osprey, and Aeolus – competed for the Royal Cork Club prize of 50 sovereigns, and the latter boat won easily. Royal patronage was not extended to any of the season’s regattas, and no royal cups were raced for. The carrying through of the Port of Plymouth Regatta led to a break between the Royal Western Yacht Club and the Town Committee. The former, whose regatta fund was not in a healthy condition, desired its abandonment. The Town Committee, whose funds were prosperous, refused to agree to this, and, in spite of the fact that the Prince Consort’s Cup was not raced for, they carried through a successful two-days programme, in which a large fleet took part. ‘Christabel’, 48 tons. In the start for the Royal Thames First-class Match, May 23, 1862. The racing on the Thames in the early part of the season was as keen as usual. The Prince of Wales Yacht Club opened the season, followed by the Royal London; and the Royal Thames, which was in a very flourishing condition, offered prizes to the value of £200. This was divided among the various classes, the trophy for vessels above 20 tons being a silver-gilt tea-service value 100 sovereigns and a second prize of the value of £20. For this match Christabel (Mr. H. H. Kennard), 48 tons, Marina (Mr. J. C. Morice), 65 tons, Phosphorus (Mr. W. Turner), 50 tons, Glance (Mr. A. Duncan), 36 tons, and Audax (Mr. J. H. Johnston), 52 tons, competed. The race was full of incident. Christabel led away to the Northfleet Hope and the Lower Hope. Encountering a heavy storm, Audax and Glance lowered topsails, and Phosphorus broke her bowsprit off short. Rounding the Nore Light, Marina got ahead of Christabel and came in violent collision with the club steamer, carrying away her bowsprit and driving a hole in the steamer. This crippled her, and Christabel raced ahead and carried off the trophy. The schooner match of the Royal Thames was won by Flying Cloud on her time allowance, and Leonara was second. A variety of circumstances which contributed to the dull racing season of the previous year were almost entirely absent during the year with which we are about to deal. Private matches were not so much in evidence, and the clubs’ programmes for racing were as full as could well be desired, and added to this satisfactory state of things, many new and powerful racing boats made their appearance. Indeed, in the matter of new productions of the builders’ craft, few seasons had proved more satisfactory. Phosphorus, as we have seen, was the champion of 1862. She was from Hatcher’s designs, and proved herself highly successful against such boats as Glance, Osprey, etc., but she was only one of Hatcher’s successful designs. 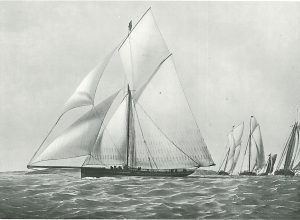 The opening of the season of 1863 brought two more important cutters from his board – viz., the Phryne and the Vindex, which made their appearance in the racing world this season. In spite of a protest from Phryne that Vindex unlawfully compelled her to go about, Vindex was awarded the first prize and Phryne second prize. The same boats met on the following day at the Royal Thames matches with a similar result, the times being almost identical though Vindex, under the Royal Thames measurement rule, got an allowance of 5½ minutes, and thus won easily. Phryne was second boat, and Phosphorus third. 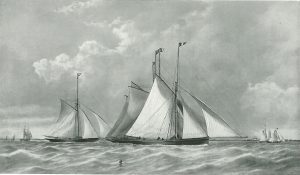 With these two matches the newcomers established themselves as dangerous rivals to the champions of the previous years, and so pleased was Mr. Seddon with Phryne that he issued a challenge to race her against any boat in the world from 45 to 75 tons for a stake of from £2,000 to £10,000, the match to be round the Isle of Wight. The challenge was never taken up, and the two cracks of the Thames went westward to the Irish regattas. At the Royal Western matches at Queenstown Vindex and Phryne met another notable production of the year, this being the Fife boat Surf; owned by Mr. C. T. Couper. In the race for the Queen’s Cup they were beaten by Surf, which had a margin of 47 seconds over Phryne; but on the second day Phryne carried off the Peel Cup in a match open to yachts of 10 tons and upwards, Vindex being second. Phryne further distinguished herself during the season by winning at the Royal Mersey Regatta, against Surf, Phosphorus, and other boats, the 100-guineas trophy presented by the ladies of Liverpool, and on the second day the £100 silver vase, though for this trophy Phosphorus made an excellent fight. At the Royal Irish Regatta Phryne carried off a purse of 100 sovereigns and a piece of plate value 60 guineas. She was also victorious in a race from Kingstown to Queenstown against Wizard, and won prizes at Plymouth and Stranraer. Her winnings for the season amounted to £760. Vindex, on the other hand, was not quite so successful, though she made a notable showing, Out of nineteen starts she won eight times, and her winnings for the year amounted to £527 10s. These new boats and their doings absorbed a good deal of atten­tion. The big-class racing did not, however, suffer from this. The schooner matches in connection with the Royal Thames Club off Gravesend brought together four famous and powerful boats of over 100 tons: Galatea(Mr. T. Broadwood), Gloriana (Mr. A. O. Wilkinson), Albertine (Lord Londesborough), and Albatross (Mr. T. Brassey). The Albertine was winner in this race. Intrigue was winner in the match for yachts under 100 tons T.M. Private matches were not altogether excluded from the season’s programme. The Squadron week opened and closed with individual sport; the Duke of Rutland’s schooner Resolution and Earl Vane’s schooner Lotus, which had met in the preceding year, when Resolu­tion fouled the Lepe Buoy and was disqualified, met again on the first day of the Cowes week. Resolution on this occasion proved herself the better boat, taking the lead at the start and maintaining it throughout. The private match which concluded the regatta week was between Galatea and Albertine for 100 guineas. This match was won by Galatea. In the racing in connection with the Royal Yacht Squadron the ubiquitous Phryne sailed magnificently against the classic Arrow for the Squadron Cup. Phryne by some misfortune was the last to start, and though she sailed a grand race against Arrow, she failed to overhaul her. The race for the Queen’s Cup brought together a group of celebrated schooners: Albertine, Flying Cloud, Aline, Volage, Petrel, and Sultana. The match finished with Aline winner, being ten minutes ahead of Albertine. Arrow won the Prince of Wales’s Cup, beating Aline and eleven others. At the Royal Victoria Regatta the principal winners were Galatea in the match for schooners, Audax in the match for cutters, and Vindex won the prize of fifty sovereigns for a match between cutters and schooners. This fleet of vessels got under way at 9 a.m., in a very smart breeze, and Aline, with the pennant of the Commodore, led them out to the Nab. At the start forty-two yachts were in close company, with two passenger steamers to accompany the fleet as far as the Nab. The breeze hardened from west-north-west, and later developed into a gale with a tremendous sea, which gave the smaller yachts a bad dusting, and disasters to gear were numerous. The Aline arrived in Cherbourg Roads at 4. 48 45, but she was not in the race. The first competitor to arrive in the roadstead was Galatea at 5 21 25. The rest of the fleet were timed as follows: Shark, 5 35 0; Marina, 5 51 0; Christabel, 6 9 30; Julia, 6 11 0; Albatross, 6 18 0; Gleam, 6 23 0; Siren, 6 31 15; Audax, 6 37 0; Fernande, 6 42 0; Miranda, 6 44. 0. This was one of the most exciting matches ever remembered. The Royal Victoria, after a return double match from Cher­bourg to Ryde, in which Aline and Christabel were the winners, gave the fleet a send-off to the westward with a match from Ryde to Plymouth. Osprey, Aline, Miranda, Marina, Amazon, Christabel, Gleam, Siren, Julia, Clio, and Terpsichore, were the competitors, and they started at 9 a.m. on August 24 in a good topsail breeze from west-north-west, finishing on the morning of the following day: Aline, 9 55 5, Julia, 11 2 30, Marina, 12 15, and Siren, 2 1. The three first took the prizes in the order of their arrival. This match finished what was regarded as a brilliant regatta. During this season the principal clubs made a bold stand against the prevalent custom of using shifting ballast, chiefly in the form of bags of shot. Up to this time it was customary for yachts to carry a large, crew, solely for the purpose of shifting ballast from one side of the vessel to the other when she tacked. It may seem incredible that the prohibition of shifting ballast should have met with strong opposition, yet such was the case. There were advocates in those early days of the useless racing machine, even as in later years there have been staunch defenders of rules producing vessels of a bad and ephemeral type. The Royal Temple Yacht Club opened the season on the Thames on May 2, followed by the Royal London on May 30, and the Royal Thames a day later. 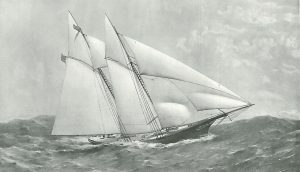 At the latter a new cutter, Astarte, 75 tons, built for Mr. Seddon, made her first appearance, and won the match for cutters by 5 seconds over Volante. The actual times were – Astarte, 4. 47 0; Volante, 4 55 5. The allowance which Astarte made to Volante was 8 minutes, to Surf 10½ minutes, to Vindex 15 minutes, and to Banshee 12½ minutes. The winner was built from the lines of Dan Hatcher by Day and Son, Southampton. This race started from Gravesend, not Erith as heretofore. Among the Irish clubs ocean matches had become an institution, the first having been inaugurated in the year 1860. The English clubs, impressed with the success of these, quickly introduced the vogue, and in the year with which we are dealing no less than seven ocean matches were sailed. The first club to follow the Irish lead was the Royal Thames. Possessed of a large fleet of vessels, there were no difficulties in arranging a match, and the entry of vessels was very large. Eleven schooners, three yawls, and thirteen cutters were entered. The smallest in tonnage was the Lightning Express (10 tons), and the largest the Zoe (162 tons), but such famous racers as Aquiline, Madcap, Albatross, and Albertine, the cutters Glance, Vindex, Surge, and Astarte; were included. Surf was entered, but her owner de­clined to race her when Astarte was entered. The sailing instructions issued to this large fleet by Lord de Ros, the Vice-Commodore, were that on June 3, the day before the race, at evening, the yachts should take their stations in the Hope ready for the race from the Hope to Harwich. The fleet was in two divisions, the first consisting of cutters and the second of schooners and yawls. Each division was anchored in tiers of three abreast, and each vessel was stationed according to her tonnage. The scene at the start was one of the most interesting in the history of yacht-racing, the activity of the crews to get each vessel away in the good north-east breeze being particularly effective. The start was made in the early morning, and Harwich was reached by the Volante, the leading boat, at 3 6 17 p.m., followed by Glance at 3 19 14; Astarte, 3 19 40; Whirlwind, 3 34 17; Surge, 3 34 20; Madcap, 3 51 38; Water Lily, 4. 13 45; Marina, 4 18 22; Amber Witch, 4 22 31; Vindex, 4 23 42; Albertine, 4 24 0; Zoraide, 5 4 30; Iolanthe, 5 5 15; Fleur de Lys, 5 6 0; Zoe, 5 19 0. The results are interesting, Volante being a 60-ton cutter and Zoe a 162-ton schooner. Lord Alfred Paget presented the prizes on board the Water Lily at Harwich. The cutters’ prize was a £50 cup, and the larger class prize an £80 cup. The Royal London followed the example of the Royal Thames, and arranged its first channel race from London (Rosherville) to Harwich on July 9. The two prizes offered were pieces of plate of the value of £40 each, one for cutters and the other for yawls and schooners, but the entry was not so large in number or diverse in types of vessel as on the previous occasion. Only one schooner (Blue Bell, 80 tons) and one yawl (Minstrel, 74 tons) were entered. The cutters included Glance, Surf, and Phosphorus. The starting-gun was fired at 4 25 30 a.m., and Harwich was reached by Surf, the first boat, at 3 44 26; Glance (second), 3 47 50; Marion (third), 3 46 53; Will-o’-the-Wisp, 4 19 15; Mars, 4 43 50. On her handicap Surf forfeited the prize to Glance. Another ocean match was sailed on June 18 from Gravesend to Ryde Pier for a sweepstake. This match originated with the Royal Thames Yacht Club, and was carried through by Lord de Ros and Captain Tucker. The start was the same as in the Channel match from the Thames to Harwich. Four schooners and five cutters were entered, and a start was made from the Union Club-house at 11.30 in the following order: Blue Bell, Marina, Vindex, Volante, Madcap, Galatea, Night Thought. At 5 56 45 p.m. on the second day Madcap arrived at Ryde, with Galatea 10 minutes astern. Madcap was awarded the schooner sweepstake, and Volante the sweepstake for cutters. The Royal Mersey Club also instituted a race from Liverpool to Kingstown for the Royal St. George’s Regatta. This match attracted a large entry for the club prizes and ladies’ prizes, seventeen yachts being entered, five being schooners, two yawls, and ten cutters, Phyrne, Volante, Albertine, Thought, and Eagle being among them. The Royal Yorkshire Yacht Club organized an ocean match, and after the Royal Victoria Regatta, ocean races to Torquay, Plymouth, Dartmouth, and Ryde respectively, were organized, The prizes for the matches from Torquay to Plymouth, and from Plymouth to Dartmouth, were offered by Mr. Thomas Broadwood, of the Royal Victoria Club, for schooners, yawls, and cutters belong­ing to that club. The prizes were a piece of plate for schooners value £60, £40 for cutters, and £15 for all vessels under 40 tons. A most remarkable series of private matches was arranged by Mr. Seddon and Mr. Jones on September 6 and 7. 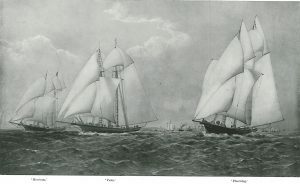 The match was made between the former yachtsman, who was owner of Astarte and Phryne, and Mr. Jones, owner of Banshee and Thought, 27 tons, to race the latter vessel against a new iron 28-tonner, to be built and called the Torpid, for both vessels and a consideration, the best of three races to decide who should be the fortunate possessor of two such craft. Both owners were well known, and the match was the event of the season. Thought had been rebuilt by Hatcher, and had turned out particularly successful. Torpid led round the course, and won the contest. Thought, however, burst her jib-sheet on the final round, and all hopes that had been entertained of her victory were doomed. Thought was sailed by her skipper, Herbert, and Torpid by Penny, who exercised extreme care. Mr. Seddon evidently appreciated the strength of his opponent, for, out of twenty men on board Torpid, seven were captains of yachts. Such a collection of ‘talent’ has sometimes proved fatal, but this case was an exception. Thought had a much more limited crew, and the men were not so carefully chosen. Captain Iremonger, who acted as referee in these matches, was for a short time owner of the Meteor, a 20-ton cutter, which gave great promise. She won her maiden race at Barmouth, only having been launched a month previously. Disregarding instructions, the captain, on the night of July 30, ran her on the Carraig Whiskan Rock at the entrance of Portdanlleyn, and she became a total loss. In Dublin Bay the season opened early and successfully. It was the Marquis of Anglesey, the owner of Pearl, who first gave to Kingstown its impetus in yachting. The Marquis was then Viceroy of Ireland, and he made Dublin Bay the rendezvous of his sport. After him followed Ringsend, and the Kingstown Rowing Club was formed. From this club came the Kingstown Yacht Club, and it, in turn, became the parent of the prosperous Royal St. George Club. The Royal Irish Club sprung up some years afterwards, followed by the Prince Alfred Club. For the second time in her short career Vindex was champion prize-winner of the year. She won £415. Phryne was not so successful, and Madcapwas second-best boat. The new cutters of the year were Hirondelle, 68 tons, built by Wanhill; Niobe, 41 tons, and Queen, 15 tons, by Hatcher; Christabel, 52 tons, built by Aldous in 1858, but subsequently lengthened. Satanella, 100 5 tons, was also a new boat. To meet these were the Arrow, Marina, Vampire, and Octoroon. Fiona, the new Fife boat, 77 tons, sailed against the veteran Mosquito, which had been altered and improved. The total amount in prize values raced for during the year reached the respectable total of £5,718, exclusive of the royal and other trophies. Under the royal clubs there were seventy-eight matches, and thirty-four matches by clubs not royal. The Queen’s Cups were more numerous than usual, for besides Her Majesty’s gift to the Royal Yacht Squadron, there were gifts of trophies to the Royal Cork and Royal Irish Clubs. Both these cups were captured by the Clyde cutter Fiona, 77 tons. Fiona was built by Will Fife for Mr. Lafone, a Liverpool gentleman. She made her maiden effort on the Mersey on July 5, meeting Mosquito, Vindex, Astarte, Banshee, Glance, and other famous vessels, and though she was fresh from the stocks, she showed to great advan­tage, and was only beaten by Mosquito over her time allowance by 30 seconds. She was, on this occasion, sailed by Houston, the Largs skipper, and Fife was on board. The next day Fiona made her second effort, but she was again beaten, showing want of ballast in the stiff breeze. She was given 30 hundredweights more ballast and a new mast, and on the Clyde at Dunoon she showed a clear way for all the crack boats, and led the fleet to the flag boat. Besides the two royal cups, she won the Royal St. George’s prize, competed for at the Royal Irish Regatta. She raced only in St. George’s Channel. Fiona was a heavily built cutter of oak, teak, and mahogany. She had a length of 76 feet, beam 15 feet 8 inches, and draft 11 feet 10 inches, with a very graceful sheer. The other royal cup – the Royal Yacht Squadron Cup – was won by the handsome schooner Egeria, built with great length and on particularly fair lines, with a keel of 72 feet, and a deck length of 77 feet, 17 feet beam, and tonnage 9922/94. In the match for the Queen’s Cup she showed remarkable powers. Owing to a mistake in the lead of her jib-sheets, she fell to leeward, but sub­sequently, when the mistake was discovered, she picked up Aline and Albertine very fast, and finally carried off the prize. Egeria was built by Wanhill of Poole. Though these two vessels were the winners of the royal cups, they were not the champion boats of the season. This honour fell, in the cutter-rigged yachts, to Niobe, in the small cutter class to Kilmeny, and in the schooner class to Aline, with Gertrude second. The Niobe was at the head of these yachts in winnings. She was laid down in 1863 by Dan Hatcher at Southampton for Mr. Seddon, but that gentleman preferring the afterwards famous Phryne, she was finished and purchased by Mr. Gordon, of the firm of Southampton sailmakers, and he rigged her in the suit of sails with which she was so eminently successful. She started her career well. It was in the Royal London Thames to Harwich match that she showed remarkable sailing qualities and won the prize for cutters on her time allowance, and was only 2 minutes 50 seconds behind the Alarm. Three days later she beat Volante, Vindex, and Glance without a time allowance, and at Harwich defeated Christabel, Volante, and Surf. Niobe had the benefit of a clever skipper. She was sailed in the open race of the Royal Yacht Squadron, and, receiving time from nearly every vessel in the match, and 40 minutes from the Arrow, she beat them all with the greatest ease, arriving close in the wake of Witchcraft (a new schooner of 240 tons, built by White at East Cowes for Mr. Thomas Broadwood), and only 13½ minutes behind the famous Arrow. The following day she defeated Wanhill’s new crack boat Hirondelle (68 tons) on time, and received her gun before Menai, Osprey, Astarte, Christabel, Vindex, Marina, and Surge. It was in these two matches that she received the benefit of her clever skipper. She hugged the mainland shore, and on the first occasion caught a breeze from Southampton Water which failed all the other vessels. On the second day she crept along under the land, and passed Hirondelle and Marina, the two leading boats, which were sailing together in the tideway. She was sailed by Tom Dutch, and Dan Hatcher was on board. Though showing wonderful powers, Niobe was defeated at Ryde, in a strong wind and heavy sea, by Volante, and at Dover and Torbay by Christabel. With these new, powerful, and successful creations of Hatcher and Fife, the glory of Glance, Mosquito, and the other cutters of the last decade somewhat faded. Glance, as her record since 1855 shows, had been a highly successful boat. She was one of the pillars of Dan Hatcher’s fame, and Mr. Bartlett prided himself that, though under 40 tons in measurement, she could sail with the largest and the fastest clippers afloat and win prizes. Her brilliant career was, however, somewhat checked by Fiona, Mosquito, Niobe, and Volante. In spite of these modern fliers, she won eight first prizes, amounting to £417. She won the Royal Thames first-class match for cutters; she carried off Sir Gilbert East’s prize for cutters, and £75 at Queenstown, where Mosquito got ashore. At Bray she defeated Kilmeny, and followed up a similar victory at Kingstown, afterwards visiting Carnarvon, where she again defeated Kilmeny, and finished the season by defeating Volante on time at Falmouth and winning the Corinthian Cup. She was owned by Mr. E. Johnson, and sailed by George Bartlett. The ‘dear old lady,’ as Mosquito was called by her admirers, was the fourth boat of the year in point of success. She left the stocks of Mare and Co. in 1848, and though her career was some­what muddled by her owners, she raced magnificently. At one time she might easily have swept the Channel of prizes, but at that period Mr. Couper did not race her, building and racing instead Aeolus and Surf. She was sold to Mr. T. Houldsworth, and in the winter of 1864-1865 she was altered in hull, and her keel was lengthened 8 feet, and the head of the stern-post was brought in 20 inches on deck. After this she opened her season badly by being run ashore at Queenstown and all but ending her career. She was got off, however, and two days later won the Prince of Wales’s Cup. She followed up this success at Liverpool, winning the ladies’ prize and £100 cup. She was, however, no match for Fiona, being beaten five times by this boat. Of the remaining cutters and their work during the year, Volante stands out as the ancient rival of Mosquito. She was a 59-ton cutter designed by Ratsey, and she had to allow Niobe 5 minutes 55 seconds, and Christabel 2 minutes 20 seconds, and 8 minutes to Glance. This was an enormous handicap, but in spite of it she landed the Southampton Challenge Cup for the second and last time. Christabel, which sailed with her in this race, lost her boat and bowsprit. Volante was lengthened at the bow and stern in the spring of 1865, and her stern-post was set more upright, but in this improvement her tonnage had been further increased, and what had been gained in the lengthening was thus lost. Her day was obviously over, but Mr. H. C. Maudsley, her owner, pluckily stuck to her, and sailed her honestly and fairly throughout the season. Volante, as we have already noted, was built by Harvey. Christabel, formerly known as the Violet, completes the list of note­worthy cutters of the time. She was built in 1847 by Aldous of Brightlingsea for Mr. Kirby, but she did little under that name, and in 1861 she was purchased by Mr. H. H. Kennard, lengthened and improved, and at once came out as a fast boat in sheltered waters. She won a great many matches, though Phosphorus, Phryne, and the other noted boats, were too good for her. In 1864 she was laid up, but in the winter she was again lengthened, though this was of little advantage against the new-comer, Niobe. Her last model was long and very low, and she was a comparative failure in heavy weather. The Vindex had by this time become somewhat outclassed. She was built of iron, and though sailing under the same skillful skipper and crew as in her palmy days, she only won two second prizes out of fourteen starts. Marina, Osprey, and Audax were also outclassed. A notable cutter, though coming out late in the season, was Hirondelle, 68 tons, built by Mr. Wanhill. She first appeared in the cutter match of the Royal Yacht Squadron against the most notable of the cutters of the season, as well as Menai, a new 79-ton cutter built by Ratsey, of Cowes. Menai was sailing well in a good breeze, and getting the best of the race. As the wind fell, however, Hirondelle, Niobe, and Christabel gradually picked her up, and eventually defeated her. Hirondelle arrived first, but her handicap over Niobe was 17 minutes 50 seconds, and she lost by time. She was a characteristic Poole boat. Her deck length was 70 feet, and beam 15 feet 6 inches. The famous old Arrow made but two appearances in the year. In the first she won Mr. Salt’s prize for the match from the Thames to Ryde, beating Alarm and twelve other boats by nearly 10 hours. The second appearance was round the Isle of Wight in the Royal Yacht Squadron open race. Here she had to give very long time allowances to all the rest of the fleet, and failed to do so, although she led home, being 13 minutes ahead of Witchcraft, the second yacht. The cutters of the second and third class (under 25 tons) were no less notable during this season than those of the first class. Kilmeny (30 tons) and Torch (15 tons) were both Fife boats, and built on lines similar to those of the Fiona. These two vessels were built for Messrs. David and Alexander Finlay, of Helensburg. As may be gathered from the dimensions of Glance and other cutters, the tendency to build with great length in proportion to beam, with very fine ends and a long floor, had been carefully developed. Kilmeny was not an exception to the accepted rule. She had all these qualities, though not in excess. The Torch, too, was on the same lines. Her dimensions were – length 43 feet 11 inches, beam 8 feet 11 inches, tonnage 14 70/94, draught aft 7 feet, forward 4 feet. She had a lead keel of 2 tons, 3 tons of lead inside, and iron ballast cast to fit. It is a curious fact that Fife greatly objected to building such a type of boat as the Messrs. Finlay designed, on the ground that it would not carry canvas well, nor would it be a good sea boat. The time had arrived, however, when the cutter had to undergo a change, and the Messrs. Finlay overruled all Fife’s objections to the long, narrow hull, and the boats were produced which set at rest any misgivings on the part of their builder. They were good sea boats, and extremely fast – faster, indeed, than anything of their kind afloat. Fife acknowledged his mistaken idea when he laid down Fiona on exactly similar lines to these two cutters. The Messrs. Finlay were keen and practical yachtsmen. They steered their own boats to victory with amateur crews, Kilmeny winning the challenge cup at the Royal Irish Club match, and prizes at the Prince Alfred Club matches. Kilmeny went round to the Thames and the Royal Eastern Yacht Clubs, but in the former matches the class did not fill, and at Granton she ran foul of Surge, and had her topmast and cross-trees carried away. Back in Irish waters, how­ever, she competed as 41 tons in a first-class match of the Royal Alfred Yacht Club against Enid (57 tons) and Dawn (60 tons), and met Xema, Echo, and Secret on equal terms. The first day’s sailing was abortive, and on the second day in a good breeze she came in only 3 minutes 26 seconds astern of Enid, and won on time, beating Dawn and Secret. At Queenstown she met the Glance, and on the famous occasion when Mosquito was put ashore, she was beaten by 28 seconds only, by Glance. As compared with the cutters, the schooners were not so notable through the season. Alarm and Aline we have known for some years as crack schooners. The death of the owner of Alarm, and the father of yachtsmen, Mr. Weld, brought about the change of ownership of this vessel. Neither of these schooners were much in evidence during the season. Gloriana did not appear in the Solent. She had been lengthened up to 148 tons, and in the Royal Thames schooner match she beat Circe and Albertine. This latter vessel was not by any means maintaining the reputation gained during her early life. She had been altered for speed, but she sailed only in the Thames, where she was beaten. At Cowes she was beaten by Egeria, and at Ryde by Aline. Sphinx, a 48-ton composite cutter, was built this year by Mr. H. C. Maudsley for himself from Hatcher’s design, and proved very successful, being second to Fiona in the season’s record. Other new vessels were Leah, yawl, 98 tons, built by Wanhill for Mr. J. W. Cannon, and Blue Bell, schooner, 164 tons, built by Camper and Nicholson for Mr. F. Edwards. Fiona stood out pre-eminent as the crack cutter, although she was somewhat unfortunate in carrying away spars. She began her season at the Royal Western Regatta at Queenstown on June 19, and went round the coast to all the principal regattas. Starting fourteen times in races that were actually finished, she won seven first prizes, two of which were Queen’s Cups, presented to the Royal St. George and Royal Mersey Yacht Clubs. In the Royal Albert Regatta (the first held by that club) she met with a very serious reverse, for in a strong breeze and sea she was fairly beaten by the 48-ton Sphinx, which showed herself on that occasion a more weatherly vessel. Fiona was the faster reaching, but the smaller yacht was able to get the lead on each round when they came by the wind. This created considerable surprise, and doubt­less Fiona was not exhibiting her true form in this race. Vindex this season retrieved her reputation, which had suffered in the year before, and won the same number of prizes as Sphinx, though she had one first prize less. Mosquito and each, and the 40-ton Christabel won several prizes Niobe won two firsts, but found the other vessels a trifle too powerful for her. The Royal Albert Yacht Club held its first regatta this season, and it was rendered doubly interest­ing from the fact that Blue Bell sailed round the Isle of Wight in 5 hours 45 minutes in a strong west-south-west breeze, beating Gloriana and Witchcraft. This was a record performance. The new Leah headed the list of yawls, and Egeria and Blue Bell tied for the honour of headship in the schooner class. Egeria and Pantomime sailed a splendid hard-weather race for the Squadron Queen’s Cup, the former coming in 1 minute 58 seconds ahead, but lost to Pantomime on time. For a handicap race round the Island at the Squadron Regatta, sailed in a strong north-west wind, there were nineteen entries. That even at this early date the duties of the handicapper were difficult to discharge with satisfaction to all, is proved by the fact that out of these nineteen entries only nine consented to start. And one can hardly help wondering why some of these accepted the conditions, for Arrow, 102 tons, was put scratch, and had to allow Pantomime, 205 tons, no less than 23 minutes 29 seconds, and Egeria 20 minutes 2 seconds. Lufra, yawl, 205 tons, was also scratch, and beat Arrow by 4½ minutes, but both lost on their allowance to Blue Bell, and also to Egeria and Pantomime, which sailed an excellent race together, finishing about a minute apart. 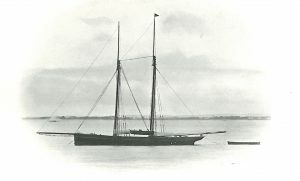 Of the smaller yachts, Vampire, 19 tons, built by Hatcher, was very successful, winning six first prizes; and Torch, 15 tons, built by Fife for Mr. G. B. Thompson, won five first prizes. These were very good records for those days, when races were still few and far between. The clubs which gave races only numbered twenty-three, and the total number of club races in the season was only ninety-one, the prizes amounting to £4,442, including three Queen’s Cups and five other cups presented to clubs. Start for the first Atlantic Race, December 11, 1866. Showing Henrietta, Vesta, and Fleetwing. 26th, and Vesta arriving three hours later. The match was for a stake of £18,000. Vesta lost five men, who were swept overboard by a heavy sea which pooped her during the passage. The avowed object of the visit was to stir British yachtsmen up to a trial of speed in an ocean match, but this, unfortunately, proved to be impossible. The American yachtsmen were received with great hospitality, and Mr. Bennett, the owner of Henrietta, offered to present his vessel to H.R.H. the Duke of Edinburgh. His Royal Highness, however, very delicately declined the gift. Important additions were made to the fleet this year. Oimara, a cutter of 165 tons, was built by Messrs. Steele and Co., of Greenock, for Mr. C. J. Tennant. She was a composite vessel, 97 feet long, b.p., and 20 feet broad, with 87 tons of ballast, 50 tons of which, were lead cast to fit, the iron being placed on top of this. The same firm also built the Condor, 130 tons, for Mr. W. Houldsworth, and the Nyanza, schooner, 200 tons, for the Earl of Wilton, Commodore of the Royal Yacht Squadron. Ratsey of Cowes launched Pleione, schooner, 62 tons, for Mr. W. Babington, and Messrs. Camper and Nicholson launched the schooner Heather Bell, 140 tons, for Mr. N. Clayton. It is interesting to note that the use of the spinnaker came into vogue about this time. Niobe (Mr. W. Gordon) was the first vessel to use one, and it may be observed that, although the new-fangled sail was received with very mixed feelings, owners were not content even with this enormous addition to their running canvas. In the Royal London match on the Thames this year Niobe added a studding-sail to her mainsail, whilst Phrynehoisted a spinnaker with a head-yard 15 feet long! In the Royal Thames match, soon after, Niobe and Vindex again used spinnakers, upon which Vanguard very logically protested on the ground that they were guilty of ‘booming out.’ However, a change of this rule had been made, unknown to Captain Hughes, the owner of Vanguard, to the effect that there should be no restriction as to canvas, and the committee therefore ordered the race to be resailed; and when this was done Vindex, the original winner, was unable to start ! The Nore to Dover schooner match was won by Egeria (Mr. J. Mulholland), with Pantomime (Colonel Markham) second. Gloriana won the down-Swin race for schooners and yawls, and Phryne won the cutter match. In the Royal Thames match to Havre, Alarm, Zoraida, Condor, Julia, Columbine, Minstrel, and Marina competed, and a great race was sailed between the new Condor and Alarm. The former had the best of it during the day, but Alarm got ahead in the night and won, with Julia second. Aline and Egeria sailed a fine race for the Squadron Queen’s Cup, which fell to the former, through sheer weight, in a strong north­west breeze. The Squadron’s cutter race was also sailed in wild weather, Vanguard winning it from a fleet composed of Fiona, Hirondelle, Dione, Menai, Volante, Vindex, and Sphinx. The Earl of Wilton’s Cup was raced for round the Isle of Wight, Egeria winning it, with Lufra second, then Pantomime and Volante. At the Royal Albert Regatta, Oimara, Sphinx, Fiona, and Volante met. Fiona led away, but was caught by Oimara, and an extremely exciting race followed, Fiona hanging on to the big cutter well, but being hunted herself by Sphinx. She managed, however, to win on time from Oimara, and saved her allowance to Sphinx. Another notable match was that of the Royal Western at Plymouth, when Vanguard beat Oimara, on time, for the Queen’s Cup, but was disqualified. As showing the vast change that has taken place since this date, it may be noted that sixteen was the greatest number of starts made by any yacht – Kilmeny, 30 tons, Mr. D. W. Finlay – and Fiona was the crack vessel of the year, with eleven starts and eight wins. Anglo-American Race round the Isle of Wight, August 25, 1868. Showing Cambria, 199 tons, Aline, 216 tons, Oimara, 165 tons and Condor 135 tons. Following the visit of Henrietta, Fleetwing, and Vesta, Captain Baldwin, the owner of the Sappho, an American schooner of 210 tons, came over to this country in the summer. She left Sandy Hook at 5 a.m. on July 30, and passed the Needles at 11 a.m. on August 14. Her object was to challenge the best British yacht of the day, and a match was got up for a sweepstake of £20 each between her and Oimara, 165-ton cutter, Mr. C. J. Tennant; Cambria, 188-ton schooner, Mr. J. Ashbury; Condor, 129-ton cutter, Mr. J. Ewing; and Aline, 212-ton schooner, Mr. R. Sutton. Sappho and Oimara were scratch, and allowed Aline and Condor 9 minutes 12 seconds, and Cambria 11 minutes 55 seconds. The race was round the Isle of Wight, and was won by Cambria, which arrived first. The Sappho was outsailed by all the British boats. She lost her jib-boom beating down the back of the Island; but this had little or no effect on the result, as she was quite beaten at the time. Sappho was 123 feet long on the water-line, 26 feet 7 inches broad, and drew 11feet of water. It should be said that in this match she was ballasted as in her ocean voyage, and is said to have carried several tons of stones. Following this visit, we have the first challenge issued by this country for the America Cup, Mr. J. Ashbury intimating his wish to take Cambria over for the purpose. However, the negotiations were protracted, and abortive for the time being. Cambria was the only new large vessel built this season. She was built by Ratsey, and met with fair success this year. She won four first and two second prizes, Egeria coming next with three firsts and two seconds, Gloriana three firsts and one second, and Aline three firsts. Of the cutters, Oimara and Fiona each won four first prizes, Niobe five firsts, and Condor three firsts and two seconds. Of the second-class yachts, Xema, 34 tons, Major H. L. Barton, won six first prizes and one second. Dan Hatcher built a new 20-tonner, Lizzie, this season for Mr. C. H. Coddington. She met with fair success, winning one first and four second prizes. A Belfast builder, David Fulton, first made a name this season by building the 12-ton Ripple for himself. She proved a smart little vessel, particularly in light weather. At this time there was much discussion as to mixed races between cutters and schooners, no standard allowance for inferiority of rig having been adopted. In some races the tonnage of cutters was doubled to put them on an equality with schooners; in others the cutters kept their tonnage, whilst that of the schooners was halved; and yet in others two-thirds was added to the actual tonnage of the cutters, whilst the schooners sailed at their proper tonnage. Such a state of things was very unsatisfactory. Hatcher built the celebrated 40-tonner Muriel this year for Mr. H. Bridson. In her early matches she had to put up with second place to Sphinx, also a Hatcher vessel of 46 tons, built in 1866. This season, under Mr. J. S. Earle’s ownership, she won first prize in the Royal London, Royal Thames, and New Thames races. 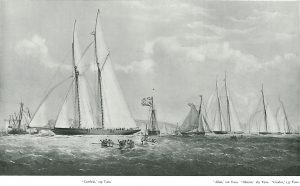 The schooner race of the New Thames Yacht Club was won by Flying Cloud (Count E. Batthyany), a Ratsey schooner of 89 tons. Cambria was first home, but lost on time to the Count’s vessel. There was a large entry for the Nore to Dover match, which was won by Mr. G. F. Moss’s cutter Julia on time from Major W. Ewing’s Condor. Egeria took the second prize. The Royal Mersey Regatta was well attended, Oimara winning the first-class race on the first day and the Ladies’ Cup on the second. Pantomimewon the Vice-Commodore’s Cup. Muriel won the second-class race on the first day, and Phasma, a Ratsey 34-ton cutter (Mr. T. Lloyd), on the second. The Clyde Yacht Club Regatta was held at Dunoon, the first-class prize falling to Mr. S. King’s Fife-built 31-ton cutter Denburn. The 15 to 20 ton match was won by Vampire (Mr. T. Cuthbert), Fairlie (Mr. R. Ferguson) taking the special prize for 15-tonners, beating Glide (Mr. D. Fulton) and Satanella (Mr. D. W. Finlay). The 5-ton class was strong in the North, for, in addition to the above, there were Mora (Fife), Queen(Hatcher), Torch (Fife), and Ripple, 12 tons (Fulton). Oimara won the Royal Northern Queen’s Cup on the first day, Muriel the second-class race, and Fairlie the 20-ton race, on time from Vampire. Oimara won again on the second day, Avon, 30 tons (Mr. W. Wylie), winning the second-class race, with Muriel second. Vampire won the 20-ton match. There was a large entry for the Squadron Queen’s Cup, which was won by Egeria on time, Guinevere (Mr. C. Thelluson) coming in first. A splendid race was sailed on the second day, in which the famous old Arrow won the prize from Volante by fifty seconds in a fleet of all the crack cutters – thirteen in all. Arrow followed up this triumph by winning the Town Cup next day, against a mixed fleet of the best cutters and schooners – thirteen in number. There was a grand breeze, and the old crack led the whole fleet all day. Aline won the schooner match on the last day of the meeting. Muriel was the chief prize-winner of the year, with five first and three second prizes, Oimara coming next with five firsts and one second. Vampire was the crack ‘twenty’ and Queen the crack ‘fifteen.’ Egeria was easily the best of the schooner class.